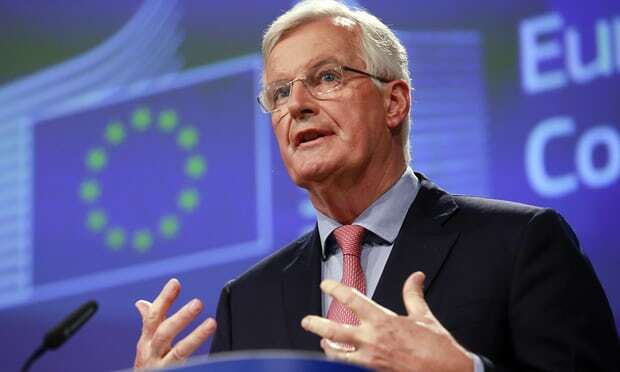 The EU’s chief Brexit negotiator, Michel Barnier, has forensically picked apart Theresa May’s white paper after a meeting of the EU27, warning that the prime minister had failed to offer Brussels a firm basis for the negotiations. In a reflection of the widespread concern about the stability of May’s premiership, Barnier said he would be polite, but went on to illustrate in stark terms how the UK’s demands fell foul of the EU’s red lines and founding principles. “I am not negotiating, of course, on the basis of the white paper,” Barnier concluded, after a three-hour meeting of EU ministers in Brussels. The bloc’s negotiator also responded to May’s strident rejection of the EU’s solution for avoiding a hard border on the island of Ireland, in which Northern Ireland would in effect stay in the customs union and single market until a trade deal or bespoke technological solution was arranged that could serve that function. The prime minister had committed to solving the problem, Barnier said, and having checks on goods passing from Northern Ireland to the rest of the UK was not the same as creating a border in the Irish Sea. A senior diplomat said member states had been surprised and disappointed by the aggressive tone of May’s speech in Belfast earlier in the day, in which she accused the EU of seeking to perform an “economic and constitutional dislocation” of her country. He suggested that the UK’s position appeared far from settled. “This white paper is the result of a very intense debate in the United Kingdom that was necessary. Everyone can see that this debate is not over,” he said. The British government has said it wants to keep the UK in the EU single market for goods based on a common rulebook. In order to avoid customs checks, the government wants an unprecedented customs system where the UK would collect EU duties, while having the freedom to set different tariffs on goods destined for the British market. Barnier said this “facilitated customs arrangement” raised practical, legal, economic and budgetary questions. Setting out the questions he had posed to the new Brexit secretary, Dominic Raab, during their first meeting on Thursday, Barnier said he was concerned that European businesses would face higher administrative costs and there would be increased opportunity for fraud. Barnier also questioned whether a non-EU country could collect EU customs without being subject to EU oversight. For this reason, EU diplomats say privately that the British plan can never be accepted. The EU is also deeply concerned that the customs plan would give outsider companies a competitive edge over European rivals if Britain and other countries used the UK as a route to avoid higher EU tariffs. “Are the British proposals in the interests of the EU?” Barnier asked. With reference to an EU position paper, which ruled out “cherrypicking” of elements of the bloc’s membership, Barnier made it clear he believed the UK had breached the EU’s red lines. Barnier’s deconstruction of the white paper came after the French government said May’s capitulation to Brexiters in parliament since its publication had made the task of negotiating a deal “even harder”. On Monday, in order to avoid an embarrassing defeat in the Commons, the government reluctantly accepted four amendments put forward by Jacob Rees-Mogg, the chair of the European Research Group of Conservative MPs, who was seeking to wreck May’s proposed custom plans. Arriving in Brussels to meet Barnier, France’s European affairs minister, Nathalie Loiseau , said the acceptance by May of amendments backed by hardline Tory Brexiters had further complicated the already troubled talks. With doubt growing about the credibility of the white paper, Jeremy Hunt, the foreign secretary, admitted the plan agreed at Chequers was merely a starting point for future talks. Questioned by reporters on a visit to Scotland, Hunt twice refused to describe the Chequers plan as the UK’s “final offer” on Brexit. “It’s our substantive offer I think is the best way to phrase it,” he said.